The MOD-WIFI-ESP8266-DEV is a tiny development board that can add WIFI capabilties to existing boards. It uses espressif system's chip ESP8266EX. All chip signals are exposed for easier access. The board can be soldered to PCB or used with a breadboard. 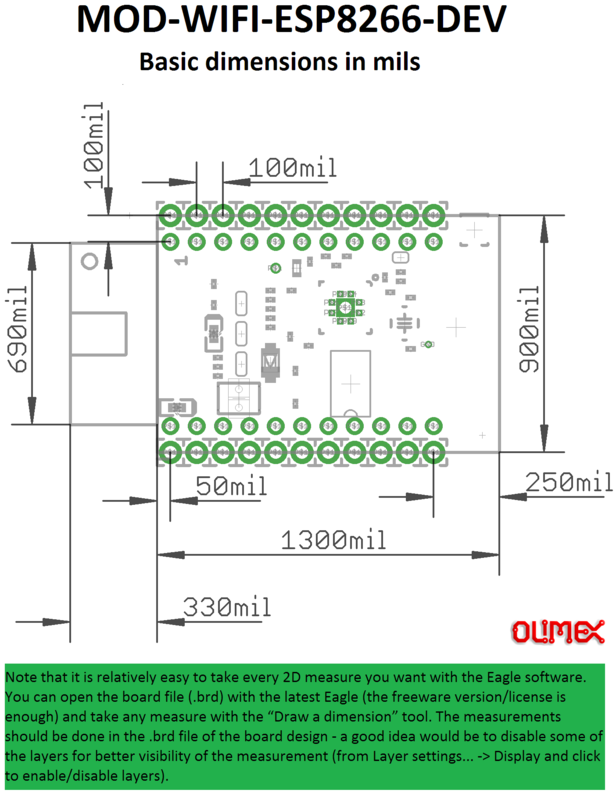 Olimex has provided pads for UEXT and pads for external antenna. The ESP8266EX is very highly integrated SoC which includes Tensilica's L106 32-bit core processor, SRAM, power management unit and RF front end. The ESP8266EX has a number of interfaces - I2C, SPI, SDIO and also a number of free GPIO pins. The chip allows the implementation of a WiFi TCP/IP stack with just few extra components beside the ESP8266EX. This module comes with 2MB (16Mb) of SPI flash memory, and all GPIO resources are available for breadboarding. The I2C and SPI interfaces are also available. It is easy to implement the module in your existing designs - you might even solder it diretly on other PCBs as it has no components on the bottom side. The module could be used for home automation, smart plugs and lights, mesh networks, industrial wireless control, baby monitors, IP cameras, sensor networks, wearable electronics, etc. This MOD-WIFI-ESP8266-DEV is recommended for people that already have some experience with ESP8266. Consider ESP8266-EVB if you are a complete beginner.